Often if feels like both our emotions and our conflict situations run out of control. It's a bit of an illusion. We can learn to control anger, and to interact more effectively to manage the conflict in our lives. We've developed some resources to help. No matter how good you are at dealing with conflict at home and at work, you can always improve. 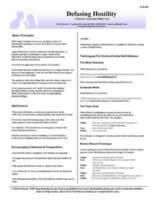 On this page you'll find mini-guides to help people better manage their conflict situations, and communicate more effectively to reduce "communication problem" conflict. Conflict and communication are crucial in the workplace. Below are our books that can be easily adapted for use in the classroom, whether the seminar is for professional development for teachers, helping staff deal with disagreements and unpleasant customers, or teaching and coaching interpersonal communication skills for families, and couples. 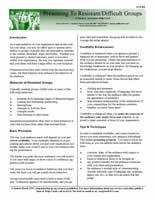 Use them to help you design courses by using the content. A completely different approach to workplace conflict. 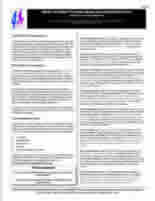 In this 110+ page book, we teach you how to modify your language - WHAT you say, so you don't accidentally cause conflict at work. We ALL use the wrong types of language, at least sometimes. 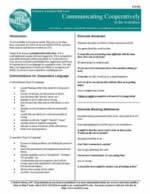 Now you can learn how to stop using conflict starting language, and start using cooperative language. Learn to cut down the confict in your personal and work life, by eliminating the gas you throw on the fire when disagreements occur. 101 phrases you should never use with family, friends, coworkers, and intimates, particularly spouses. This book teaches you what to say to cool tempers, and prevent emotional conflict. The educational research is clear. Kids who have parents involved in their education do much better. It has to be the "right" involvement, and teachers are dealing with emotional, even angry parents every day. 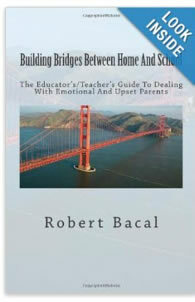 In this groundbreaking book for educations, we teach how to deal with the most difficult parent-teacher interactions. All of the techniques from our other books for dealing with angry customers, but without the exercises. A cut above the usual "don't take it personally" advice. 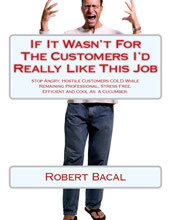 Ideal for trainers who want to put together a course on dealing with difficult and angry customers. Take the content, incorporate some learning activities and you are ready to go. 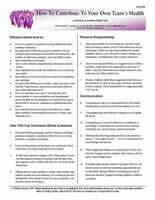 If you are looking for great handouts and takeaways for your seminars and group work (or coaching), check out our mini-guides on communication and managing disagreements more effectively. You shouldn't deal with conflict situations the same way across the board, since each one is different. With the help of this LearnBytes mini-guide, you can learn which methods of conflict management work in what situations. Start controlling conflict before it controls youby making conscious decisions that fit. Absolutely UNIQUE content to help people identify the "markers" people use in their communication that indicates they are operating in "bad faith", or even lying. You can't "read people like a book", but you can identify when something is "not quite the way the person indicates. We share with you the best way to help create an effective team byfocusing on your own contributions. Twenty four key actions and attitudes to help you make your team experience a success for you and the team. PERSONAL RESPONSIBILITY is our focus. Summarizes how to change language that PROVOKES unnecessary conflict (confrontational language) into peaceful cooperative communication. 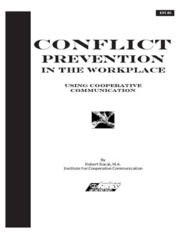 Based on our book, Conflict Prevention In The Workplace. If you speak, present or communicate with groups, particularly if you have bad news to impart, you MUST be prepared for group resistance, ranging from subtle to heckling. Learn to cope with the most difficult and resistant groups, by learning the skills and advice we provide in this mini-guide. 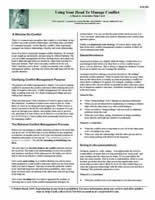 Tips & hints to reminds staff about the basic techniques of handling hostile, difficult and abusive customers. Using empathy, not taking bait, self-control, and same tricks to get control of unpleasant interactions. Meant as a job aid to be kept at a work station, contains many of the techniques from our customer service books. No relationship is without fighting and arguing. What distinguishes relationships that work from those that don't is how the arguing is done. You can learn to fight fair, and actually reduce the negative effects of disagreement while reducing the chances of arguments in the future. Many of us haven't had a chance to learn fair fighting, and that brings us to our Learn To Fight Fair Helpcard, a fast way to learn what to do and not do -- and something you can share with others you tend to argue with; friends, family or co-workers. Ideal to use on one's own, with a spouse, as an adjunct reminder for counselors and therapists, and even applies to work related relationships.